Spring has finally sprung, Ladies and Gentlemen! Here at Free Spirit Alpine we are definitely enjoying this ‘bumper season’ of snow that we’ve had, and the cold temperatures does mean that the snow is staying in impeccable conditions. But let’s not lie; part of skiing in March and April is being able to eat in a lunch spot on the side of the piste without getting frostbite. Or ending the day outdoors, listening to live music, sipping a cold drink and topping up the face-only tan. Up until this week, whilst we’ve had fantastic snow, we’ve only had a few bluebird days, and those have stayed rather fresh. But at last, we’ve had a couple of warm evenings approach and with that, the blue skies have gone to my head, and I’ve decided to put pen to paper and list our favourite lunch spots! So grab your baguette with ham & cheese, pop an Orangina in your bag and stop for lunch with a view! 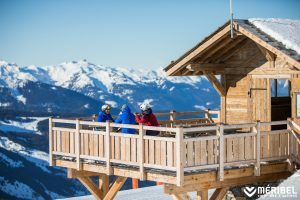 Ski down from the top of the Saulire Express towards Meribel via the blue run and just above the mid station, tucked on the left you’ll see this glorious hut. With inside and outdoor seating, anybody is welcome to pull up a pew and tuck into a sandwich, and perfect to hop back on the Saulire Express to whizz back up to the top again after! Benches galore make lovely lunch spots. What’s great about this area is that it’s easily accessible if members of your party aren’t skiing as there are fabulous walking paths around that area. 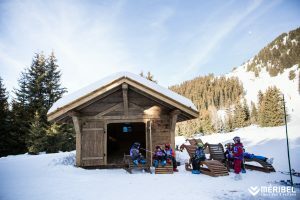 Also brilliant for beginners, so an all-round good area and easy to get back up the hill, down to Méribel Village or Méribel Centre. Also on the Altiport is the Inuit’s run, which has a fabulous area for children to play, and some great picnic tables and lounging chairs. These heart seats, installed last year, have been a great hit. 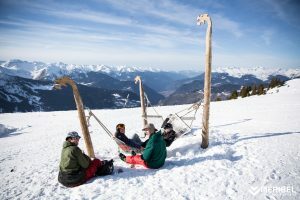 The perfect romantic lunch spot, head down from the top of the Plattieres lift and you’ll find them just opposite the Chatelet chair lift, at the bottom of the DC snow park. The same heart seats, but two together and a lovely little table too. 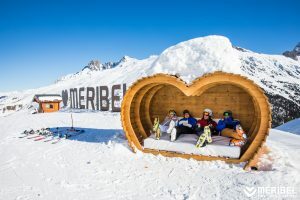 Head to the top of the Plan de l’Homme chair lift from Méribel Chaudanne and head down the blue to this cheeky little lunch spot. Also known as Pic Bleu, this run is the ultimate in picnic spots. Hang in the hammocks, and swing above the clouds whilst you chow down! One of my personal favourites, and definitely not to be missed. It’s a blue run down, and great fun to follow the dragon down the piste! On the same great run, just a little further down at the foot, is located this lovely little hut, perfect for adults to lounge! Take the speedy new chair and when you reach the top you’ll see a little boulevard near the top of the Teppes lift. Walk along it a little and find a spot which takes your fancy. Sit enjoying the view of La Masse before you ski back down. If you’ve got children with you, take time to explore the fun wild area. Of course, you can just stop anywhere you like as long as you’re just tucked out of the way of skiers! Make sure you’re not over a little lip, and you’re in view in case people are skiing off piste. Don’t venture too far from the piste for your picnic – a picnic avalanche is never fun! Lastly, remember to take your rubbish with you, and keep your picnic spot just as glorious for the next people who take a break there. Enjoy the sunshine!